It was great to read Katia's post on "Pardon Me For Asking" about the New York City Economic Development Corporation (EDC) looking for a consultant to "Fix the Ditch". i.e. address the issues of pollution and noise that are created by the BQE where it cuts through Carroll Gardens and Cobble Hill. Dan Wiley, who represents Congresswoman Nydia Velasquez, had brought up the fact that this was on the Congresswoman's agenda when he attended a meeting on May 21st convened by Council Member Sara Gonzalez at which members of the EDC, representatives from the Port Authority and other community representatives were brought together to allow the EDC and PA to explain their latest plans for the Red Hook, Brooklyn piers - specifically Pier 11 and the Atlantic Basin. This meeting had been convened, partially, to address the fact that CM Gonzalez hadn't been informed about the recent signing of a lease between the EDC and Phoenix Beverages for the Red Hook location, even though she had been intimately involved in the issue and had been supporting a compromise plan to allow for the accommodation of Phoenix Beverages, the New York Water Taxi, and Portside NewYork on that site. The EDC and Port Authority were silent on this question - apart from a statement from the Port Authority representative that there were "less ships than ever" at the Red Hook Container terminal ... and the affirmation that (and I'm paraphrasing here) he'd been in shipping for decades, and what would I (who had asked the question) know about shipping? Well, I wish I'd remembered to say that last time I had the opportunity to ask a question to a Port Authority representative about why they hadn't instigated the practice of "cold ironing" or "shore power" at the Cruise Terminal when it was being planned and built, so as to have it already operating when the terminal was first opened, instead of 6 years later (as it will be if they manage to get it up and running in the time frame they are hoping for) - that representative's answer was that they, the Port Authority, hadn't known about it beforehand. Astoundingly, the representative from the Port Authority (presumably with a long history in shipping, as with the other gentleman I mentioned) when asked when he personally first heard of the "shore power" alternative, said he'd only heard of it a couple of years before. Wow. This seemed amazing to me, considering I'd written my first letter to Mayor Bloomberg concerning this matter in 2005 when the terminal was being built, and the practice was already being implemented on the West Coast then - not to mention other parts of the world. Why was I (not a shipping expert) aware of this before they were? Or was it just a way for them to establish plausible deniability? Mmm. So, getting back to the meeting - the question was being asked why the issue of the pollution created by the expansion of the Container Terminal was not being addressed, studied, acted on, etc. - especially considering the known facts about increased cancer and asthma incidences around ports directly connected to these ship emissions. 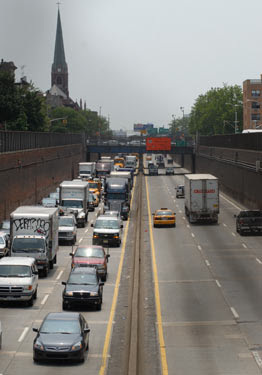 It was then that Dan Wiley brought up the fact that this push from Congresswoman Velazquez to deal with the BQE trench was partially in response to the clusters of cancer (and asthma, I believe) along the length of the BQE. The covering of the trench, and the resulting improvement of air quality around the trench would result in health improvements for the people in the neighboring residential areas of Cobble Hill and Carroll Gardens. Good job. What a great idea - and what a terrific opportunity to reconnect severed neighborhoods and improve the health of the people living in those neighborhoods. And so, as we see from the "Pardon Me For Asking" post, the EDC, as seen by its seeking of this consultant, is moving ahead to ensure this positive result is achieved for our neighborhoods. I just can't help but wonder why the EDC - their Maritime Department - have shown such lack of regard for the same population who are being affected by the carcinogenic emissions of the Container Ships? Why are the ships being let off the hook? Why aren't the effect of their extra-dirty diesel fumes being mitigated when there's an alternative - read the side bar of this blog to get a good idea of what we're talking about here. One ship = 12,000 cars. The operations of the Container Terminal are expanding and no environmental impact study is required - nor felt to be morally responsible? Pollution mitigation. Reconnecting of neighborhoods. Improved health for already affected populations. Aren't they worthy goals for Red Hook too? Wouldn't they be important improvements for the quality of life in all of our neighborhoods? According to the EDC and the Port Authority, apparently not. Unfortunately, it seems as though the EDC is happy to help "Fix the Ditch", but not the Docks.